As 2013 music sales figures come in, the picture of streaming growing while download sales slow is coming sharply into focus. It is one of a clear phase of transition/cannibalization (delete as appropriate depending on your point of view) taking place because the majority of paying music subscribers were already download buyers. But that is not the whole picture. There is an even fiercer form of competition for spend that, as far as the music industry is concerned, is inarguably driving cannibalization. The iTunes Store accounts for the majority of the global music download market and has done so since its inception eleven years ago. Back when it launched, the iTunes Music Store helped transform the iPod from a modestly performing device into a global hit. Music was the killer app, music was what Apple used to sell the device and music is what iTunes customers spent all of their money on. But all of that changed. As Apple’s devices have done progressively more, Apple has introduced new content types into its store that better show off the capabilities of its devices. When Apple launches a new iPad it doesn’t have a label exec holding up the new device playing a song with static artwork displayed…that simply would not showcase the device’s capabilities. Instead an EA Games exec gets up on stage with a new game that fully leverages the capabilities of the iPad’s graphics accelerator, the accelerometer, the multi touch screen etc. Music may still be the single most popular entertainment activity conducted on iDevices but it is no longer the app that fully harnesses the devices’ capabilities. In fact because music products and services remain stuck in the rut of delivering static audio files – YouTube notably excepted – it is increasingly failing to compete at the top table in terms of connected device experiences. Crucially, this is not just a behavioral trend, it is directly impacting spending too (see figure). 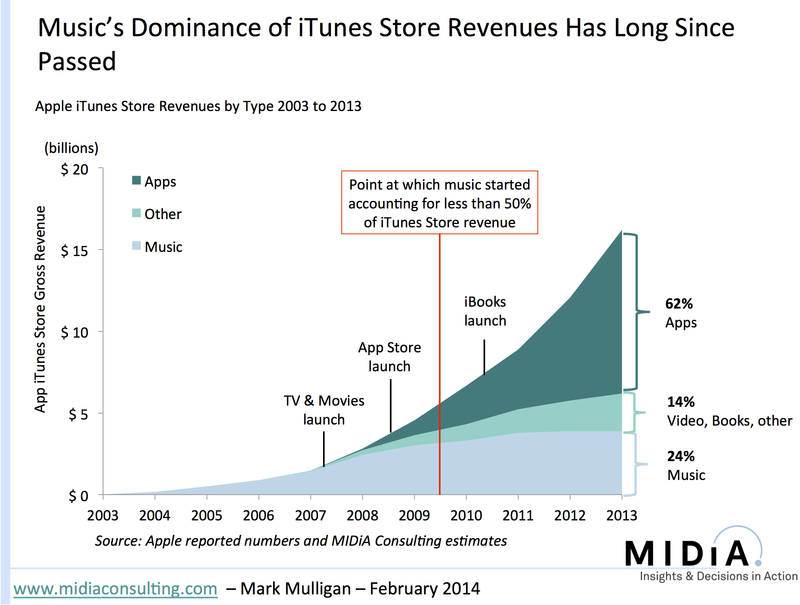 Back in 2003 music accounted for 100% of iTunes Store revenue because that was all that was available. Over the years Apple introduced countless new content types, each of which progressively competed for the iTunes buyer’s wallet share. The step change though occurred in 2008 with the launch of the App Store. The impact was instant and by mid 2009 music already accounted for less than 50% of iTunes revenue. By the end of 2003 the transformation was complete with Apps accounting for 62% of spending and music less than a quarter. Quite a fall from grace for what was once the undisputed king of the iTunes castle. Now it is clear that the app economy is a bubble that is likely to undergo some form of recalibration process soon (80%+ of revenues are in app, 90%+ of those are games, and the lion’s share of those revenues are concentrated in a handful of companies) but the damage has already been done to music spending. If music industry concerns about download cannibalization should be addressed anywhere it is first and foremost at apps. At least with streaming services consumer spending remains within music rather than seeping out to games. Though the bulk of the app revenue is ‘found’ incremental revenue, apps are additionally competing for the share of the iTunes’ customers wallet i.e. growth is coming both from green field spend and at the expense of other content types. Though we are nowhere close to talking about the death of music downloads, apps have turned the tide for music spending. The music industry can either sit back and feel sorry for itself, or seize the app opportunity by the scruff of the neck. This entry was posted in Ad Supported, Apple, Apps, Ecosystems, Freemium, Mobile, Music Products, Paid Content, Subscriptions and tagged App Store, Apple, Apps, Cannibalisation, Digital Downloads, Download Sales, iTunes, iTunes Store, Mobile Apps, Streaming, Subscriptions, Transition by Mark Mulligan. Bookmark the permalink. Mark, It is very simple. Music has to be locked-up in virtual walls and monetized at the discovery moment. It doesn’t matter if you are streamer or iTune customer, you want something that is not yet on on your streaming play list or you want to by the owner, you have to pay! All we need is to limit display information and convert all, useless at the moment to music suppliers, music ID services to cash registers of the industry. Billions of Shazam, Gracenote, Soundhound and lyric ID transactions go as a service to freeloaders. Just find the size of current ID traffic and you will see that we can double the industry with price at 39c per tune and only 20% of folks signing up in to new market arrangement. Google has precise numbers. I absolutely agree with your three recommendations about the need for compelling in-app experience for streaming music services. I’d add one point – it’s only Apple that rigorously polices the requirement to use in-app billing – all the other major app stores allow direct to mobile billing which, in developed economies at least, is usually significantly less costly than the 30% of gross charged by Apple for in-app billing. I completely agree that the future is with “digital era, multimedia products,” but curiously the thing that seems to be standing in the way is the current state of the streaming music services. First reason is that other than breadth of catalog, there is no real innovation happening. They’re selling the exact same product as the download (an audio-only file), except now it’s much less remunerative to the artist/label/publisher on a per-play basis than downloads or CDs. Most of the “apps” I’ve seen within Spotify (for example) are nothing more than branded/glorified playlists. Perhaps there’s some value in that, but it’s not revolutionary. I guess it’s possible that the streaming services themselves will take up the innovation cause, but their ability to offer innovative apps/services is unclear, plus they’re probably quite constrained by the deals they’ve already signed with the labels. All of these bells and whistles separate the listener from the actual music. Music is an old fashioned art form, like a book. It is best enjoyed when simply listening. I fear that people are too distracted to immerse themselves in music, and your solutions will make that even more so the case. Think of your typical internet radio listener: they’re not even listening! They’re at best half listening while going about doing something else. Add in apps, games and multi-media, and the music’s value has gone down to nearly zero. Case in point: Bjork’s app album. I bought that, and was really excited about it. Within a couple of months I deleted it (having spent over $10 on it). It didn’t work, nor will many of these other ideas. The further you get away from the point of music, the more the scheme will be at best a passing fad, like ringtones. I just think it comes down to the music, and if people get to hear it. Adele’s 21 shows that people WILL pay when it is really, really good AND it was given the radio play so people could hear it. I do enjoy reading your blog, even though I am beginning to fear that the cause is hopeless. Well, rephrase: there is hope, if people sign up for streaming services (as in pay for them), and decide they can’t live without them. Then, there is a future. Lynn S is absolutely right: Music is an audio product. In-app payments are killing the game experience. It’s hard enough to get music consumers to pay once (for a download or a subscription). Why should there be “in-app payments” aka additional payments while listening to music? The music industry should try to understand the dynamics of music / of genres / of radio, TV, the internet etc. … and of the needs music satisfies (These needs might be totally different from the needs games satisfy). Every few years there might be a music-related product (videos, ringtones) which will be trendy (and commercially viable) for a (usually) short period of time. But the core product is (and always will be) audio. This sounds like its 1990 again. Almost a quarter century ago the music industry tried to kill off the CD and push multimedia products like CD-Roms, CD-Vs & CD-Is (and lots of other “interactive”, “multimedia” formats). It didn’t work then, why should it now? Artists will need to develop and own their distribution channels and leverage the power of limiting distribution of new releases into the channel. The windowing model works, indie releases are gaining market share and negotiations are useless because far too much has already been given away. Multimedia products – I agree the song will always be above all else the core of the music experience and that nothing should get in the way of that, however the world’s most successful music service – by along long way – has video, lyrics, interactivity and social functionality….YouTube. Like it or loathe it, this is where consumer behavior and demand are heading. Well for me, licensing my music to game creators captures this opportunity. Also, for those games that use my creative commons license and credit me I get sometimes literally thousand of visitors in a day and that translates into more adSense income. So really its all about using the online content blogging model, and not the old music business one. Yup – the beauty of a great product is one that delivers its benefits so seamlessly that you don’t even notice many of them. There are many many other free alternatives to YouTube, not least the Torrents, but also the likes of Soundcloud, DailyMotion, Vimeo, Spotify free etc, but none of them do the job as well as Youtube does for its audience. And do not underestimate the videos and the lyrics. These are main drivers for very large swathes of YouTube users. I’m a singer songwriter, Group: Allegash. Location: iTunes, cdbaby. I get all my music on utube. Why? Two reasons. First, I like video of the performer accompanying their music because like the concert, it is the most entertaining and emotionally evoking music form, always has been. Second, it’s free. However, while I will occasionally buy a song, I am far more interested in the purchase of good music documentarys and concert video. Sure, interactive this and that, app this and that. But great music video holds the key, utube has proved it, facebook indirectly confirms it. We like music, we like pictures/video, we like them best together. The challenge for the music community is; how do you notch up the utube music experience and make it irresistible to the point that someone like me will reach out and actually purchase it. On a different note, similar to the plight of yesterday’s farmer, how can we make the art of music a paying job again and not just an avocation? We have, in my opinion, experienced a drastic loss in quality and diversity in today’s music. The challenge is two fold I guess. But what interesting challenges! Where are you Edison, Gates, Jobs? Jesus…YouTube is OLDER than all those other free things you list. It was the first, it is free and people can share the vids easily. There is ABSOLUTELY NOTHING for any musician or label to learn from YouTube. Nothing. It is free. And like Google, it’s turns a near-blind eye to the daily piracy on it’s site. It is a parasite. It cannot exist with content. Nearly none of which it produces or pays for. Yay Youtube.